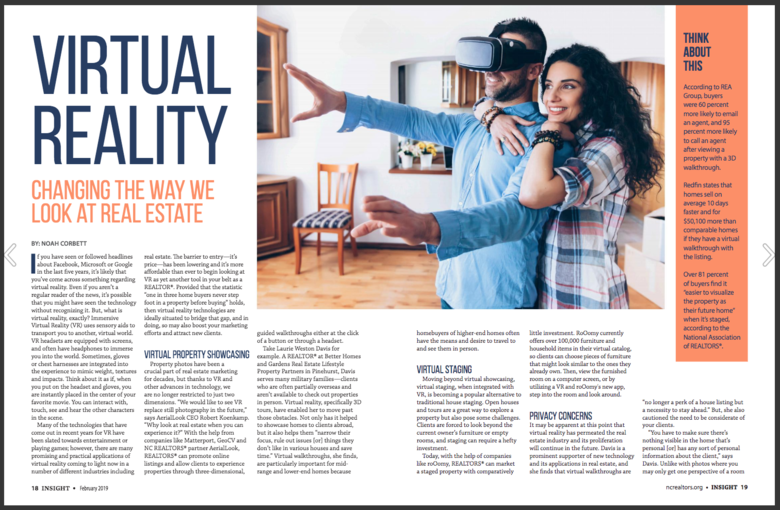 In the Insight Magazine – The Voice of Real Estate in North Carolina – February 2019 edition is the article: Virtual Reality: Changing the way we look at real estate. "The barrier to entry – it's price – has been lowering and it's more affordable than ever to begin looking at VR as yet another tool in your belt as a REALTOR®." "Provided that the statistic 'one in three home buyers never step foot in a property before buying' holds, then virtual reality technologies are ideally situated to bridge the gap, and in doing, so may also boost your marketing efforts and attract new clients." "Why look at real state when you can experience it?" says AerialLook CEO Robert Koenekamp. "...virtual walkthroughts are 'no longer a perk of a house listing, but a necessity to stay ahead," says Pinehurst, NC Better Homes & Gardens Real Estate Lifestyle Property Partners Laurie Weston Davis. "According to Goldman Sachs, by 2025 the industry around VR will be worth $80 billion and it's projected that VR applications in real estate will be worth $2.6 billion alone."